The Vectrix VX-1 designed to excel in outdoor environments, functioning safetly on any surface usually traversed by traditional police motorcycles and mountain bicycles. 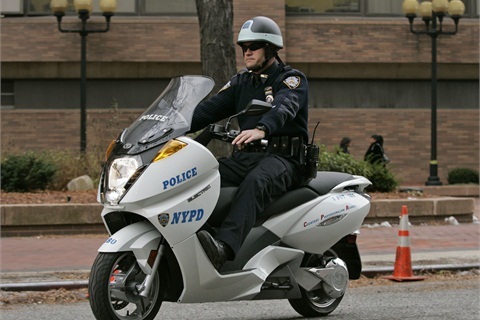 NEW YORK – The New York Police Department (NYPD) has deployed two all-electric Vectrix VX-1 Law Enforcement Model motorcycles at the NYC 9/11 Memorial Site. These bikes join the original fleet of Vectrix VX-1 bikes in service since 2007. NYPD also deployed six Vectrix VX-2 50-cc-equivalent scooters for use in parking enforcement patrols. Other public safety agencies using Vectrix vehicles include the Washington D.C. U.S. Capitol Police Department, Washington D.C. Metropolitan Police Department, New York Police Department, and Las Vegas Metropolitan Police Department. They have deployed the Vectrix VX-1 Li/LI+ and Vectrix VX-2 vehicles, according to the company.